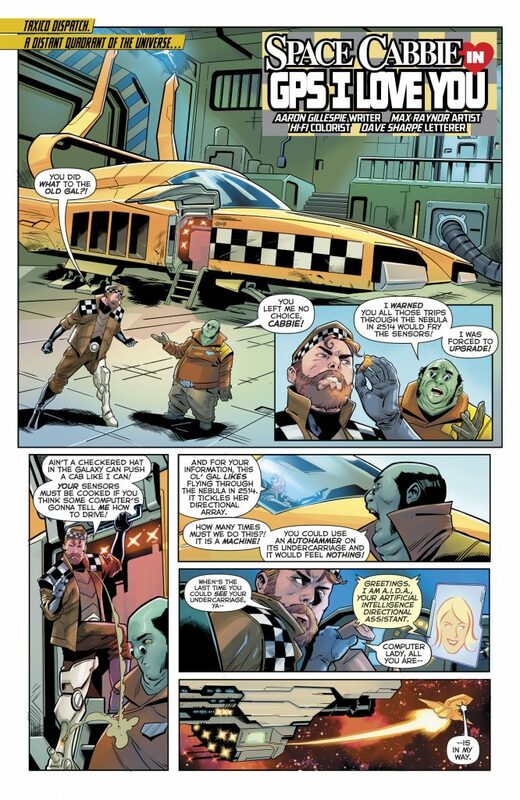 THIS REVIEW OF ‘MYSTERIES OF LOVE IN SPACE’ #1 IS SPOILER-FREE. by Brendan Hodgdon. 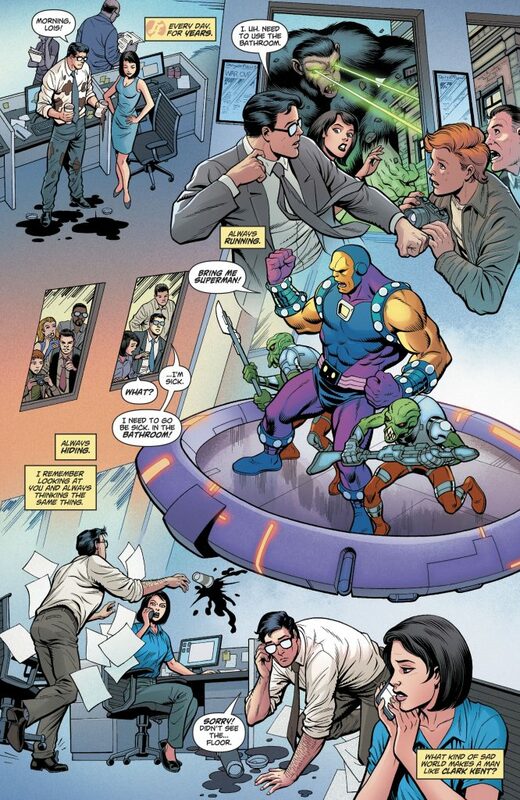 Throughout the annals of DC Comics history, one of its strongest forces has always been love. 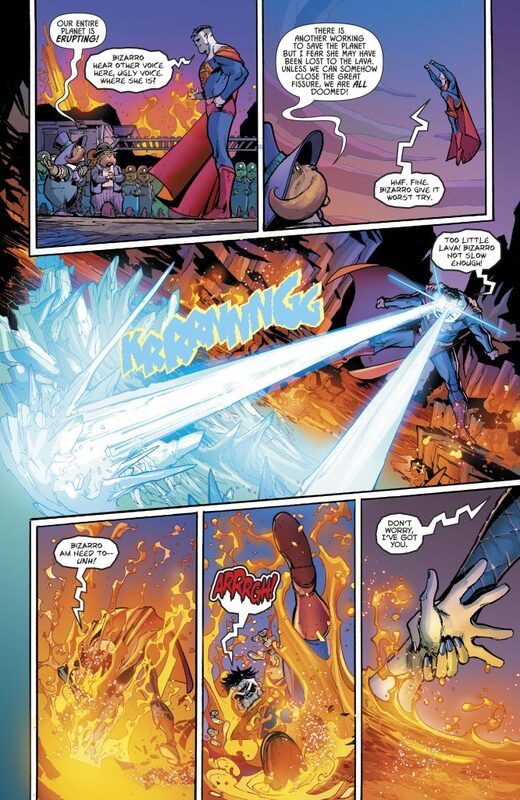 The affection, romantic or otherwise, amongst the Multiverse’s great heroes has often been a guiding light in the face of destruction… or has been the source of destruction itself. 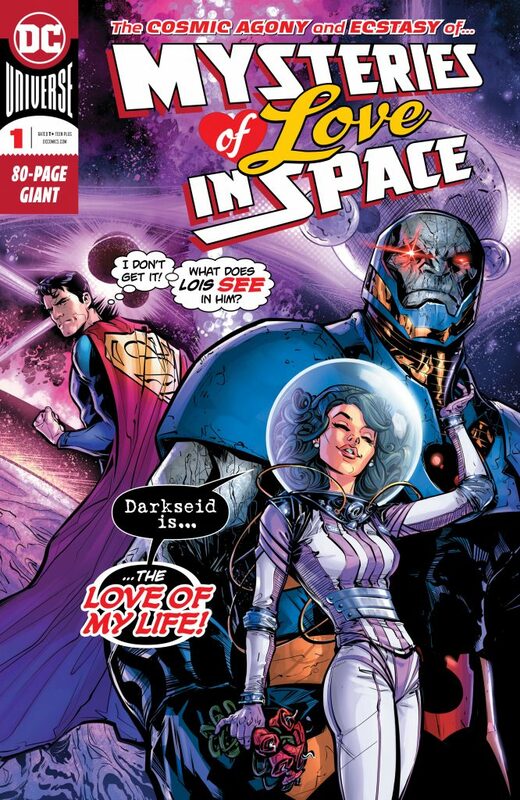 Suffice it to say that there is a wealth of options for romantic storytelling in the DCU, and the creators and editors of Mysteries of Love in Space have taken full advantage of that fact for this fun anthology. 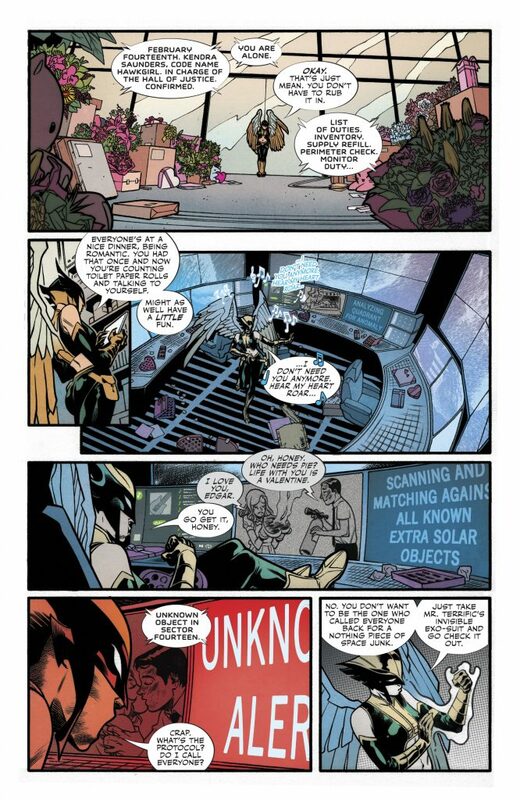 There are a successive trio of stories—“Old Scars, Fresh Wounds”, “Backward Heart”, and “Galentine’s Day”—that provide solid superheroic spins on classic Valentine’s Day story tropes. 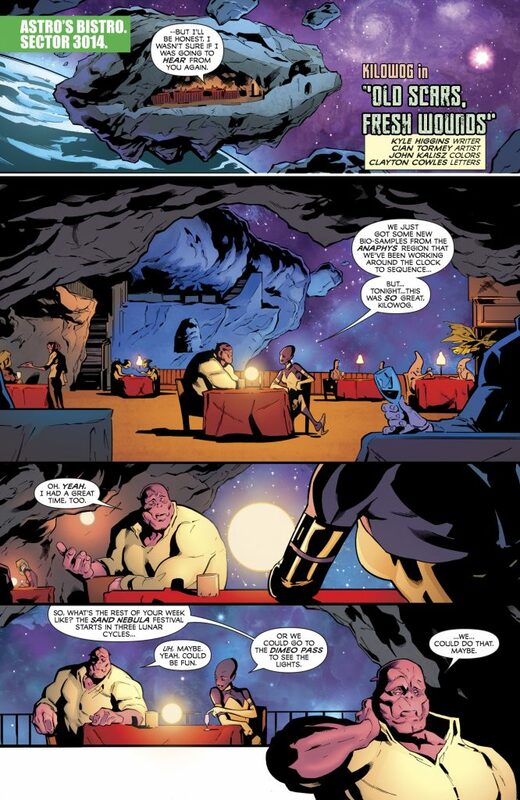 The first, from Kyle Higgins, Cian Tormey, John Kalisz, and Clayton Cowles, is a Kilowog story about opening yourself up to love after a loss. 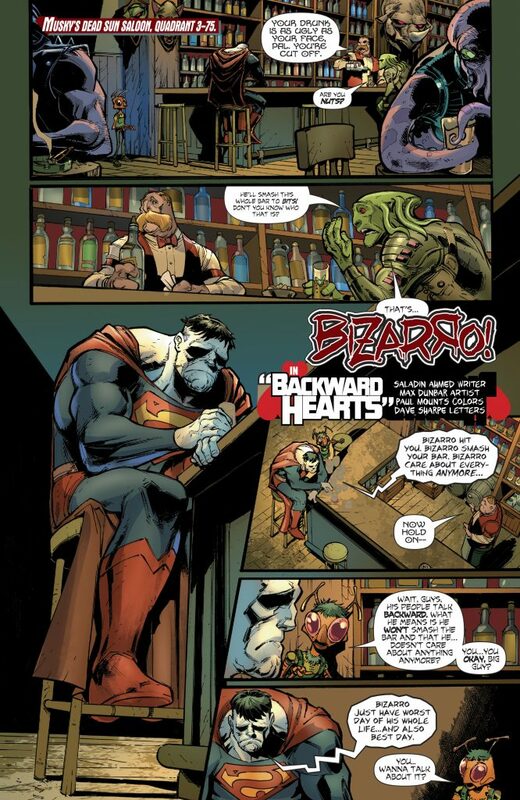 The second, from Saladin Ahmed, Max Dunbar, Paul Mounts and Dave Sharpe, is a story about Bizarro having a brief moment of self-actualizing romance. 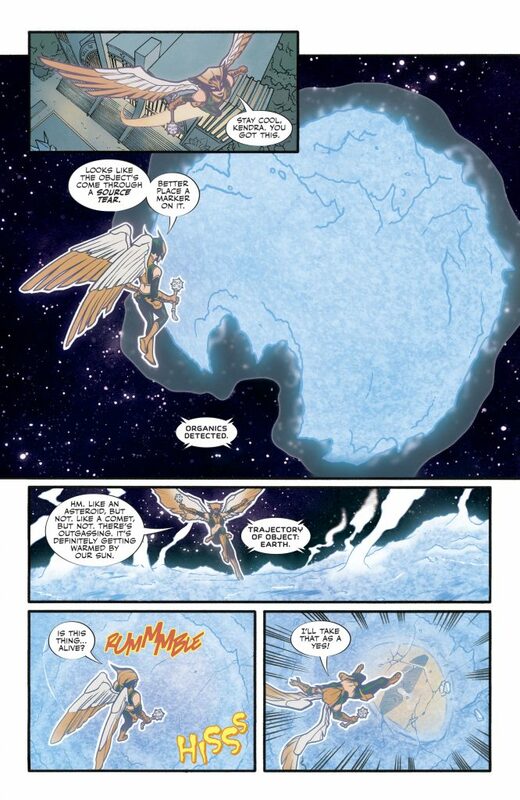 And the third, from Cecil Castellucci, Elena Casagrande, Jordie Bellaire and Steve Wands, sees Hawkgirl confront a lonely Valentine’s Day (and an intergalactic monster) with the help of Starfire and Jessica Cruz. These three stories are decent enough on a story level, employing plot beats that have all been done ad nauseam on any given sitcom. 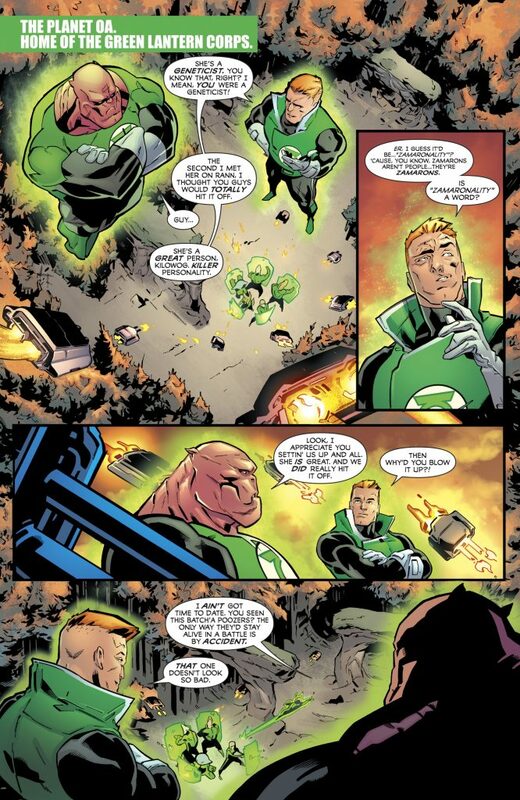 All three, however, provide a great launching pad for the artists to play with these characters, and they do so to great success: Tormey brings great emotion to Kilowog, and the way he and Kalisz handle Lantern powers mark them as a dream team for a future GL book; Dunbar and Mounts use an exaggerated style to bring real earnestness to Bizarro while still giving him a vaguely EC Comics aesthetic; Casagrande’s style is way more indie than one might expect for a cosmic Justice League tale, but it works incredibly well for the intimate circumstances of the script. Aaron Gillespie and Max Raynor’s Space Cabbie story, “GPS, I Love You”, is probably the installment most likely to obtrude here, mostly because it’s so weird. It’s a story where the interstellar cab gets an upgrade with advanced AI and the Cabbie subsequently falls in love with his ship (so basically, that episode of Futurama when Sigourney Weaver voiced the Planet Express Ship). As bizarre and silly as the story is, it does celebrates freedom and how love can help you find your true path, and works pretty well in that respect. 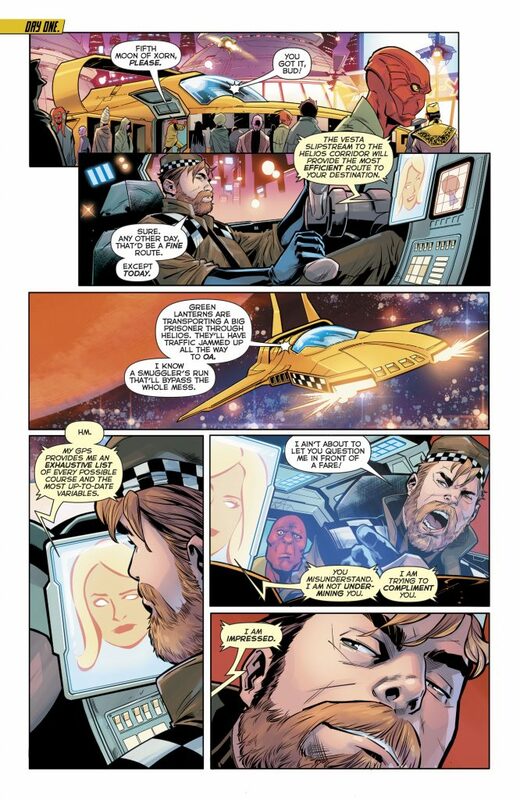 Plus, Raynor’s work with Hi-Fi and Sharpe is grade-A, the kind of art you would expect from a marquee ongoing series rather than a goofy Valentine’s Day short. 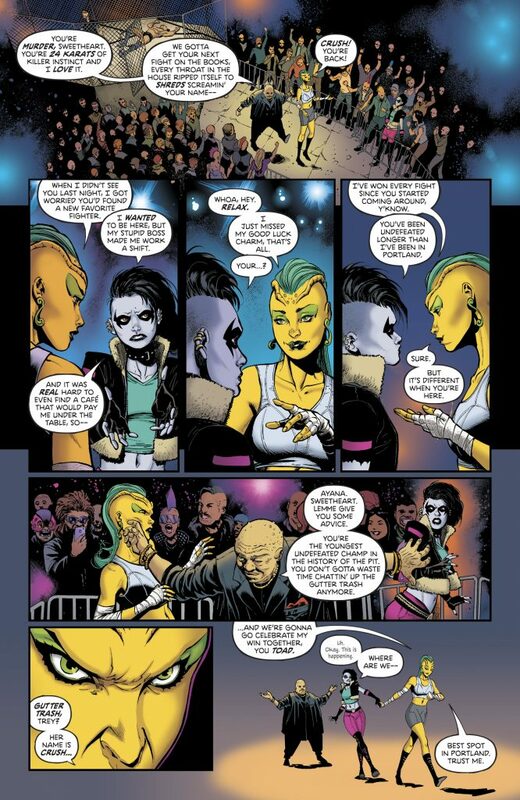 “Crushed” (from Andrea Shea, Amancay Nahuelpan, Trish Mulvihill and Tom Napolitano), stands as the sole LGBT romance of the anthology, and one of the more bitter and upsetting stories of the book. While I’m sure people will be disappointed not to see a more uplifting example of queer representation in this collection, Shea does use this story as an effective way of examining how marginalized people can be turned against each other for the sake of the status quo—which lends the newest Teen Titan some relatable depth. 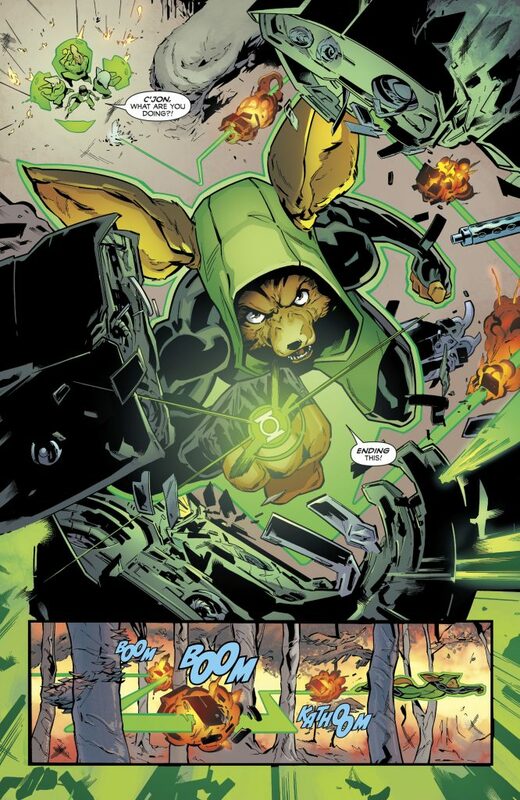 As far as art goes, Nahuelpan, Mulvihill and Napolitano blend cool alien designs with dingy Earth settings to give us a brutal glimpse of what hardscrabble living is like on DC’s version of Earth. 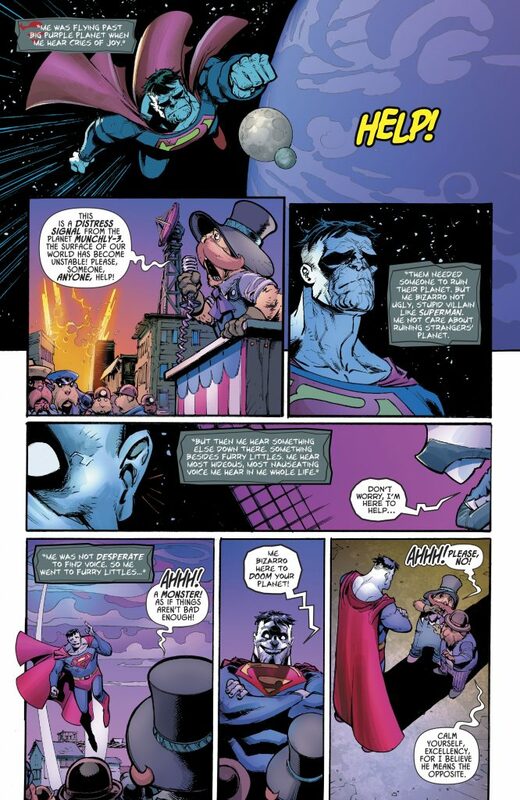 While all of those stories are pretty good, by far the best two happen to be the ones that bookend the anthology: “An Apokoliptian Love Story” by James Tynion IV, Jesus Marino, Romulo Fajardo Jr and Cowles, and “Glasses” by Jeff Loveness, Tom Grummett, Cam Smith, Adriano Lucas and Napolitano. 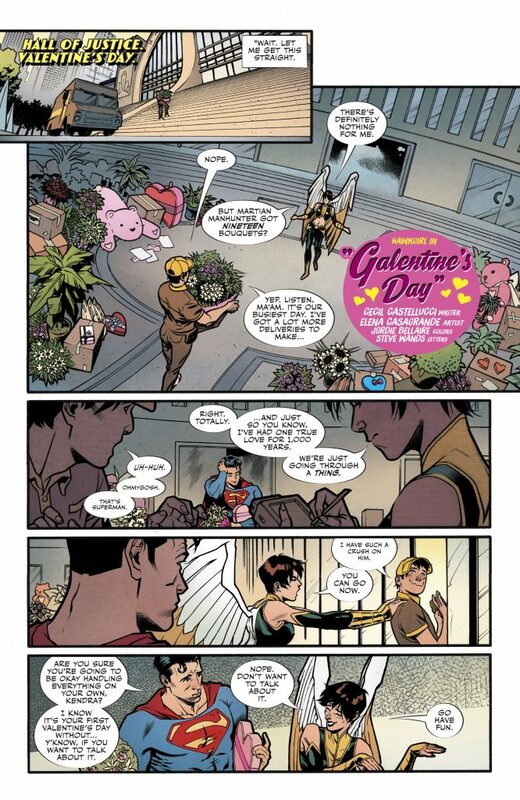 What makes both of these stories work so well is that, rather than starting with more traditional V-Day stories and fitting them into the world of DC, these seem to be constructed around these characters. They feel more specific to the universe than their neighbors in this book… so, of course, they wind up being more resonant, and more universal. 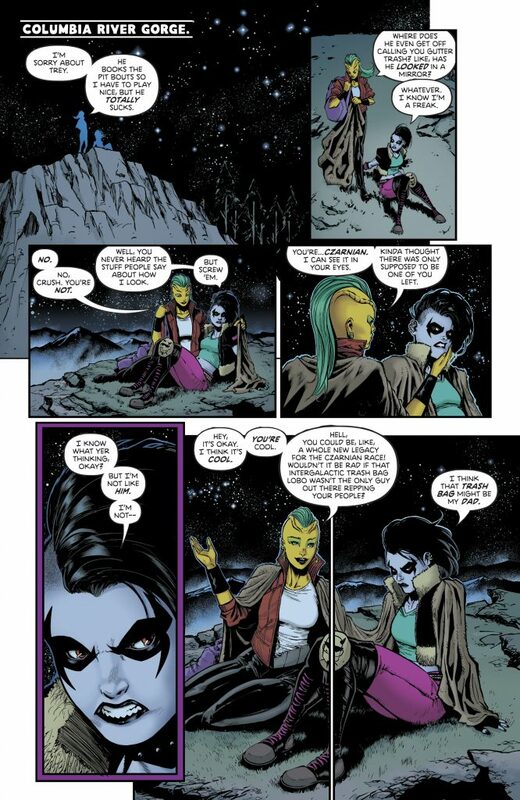 Tynion and Marino’s Apokolips tale is an antagonistic and cynical way to kick off a love-themed anthology. 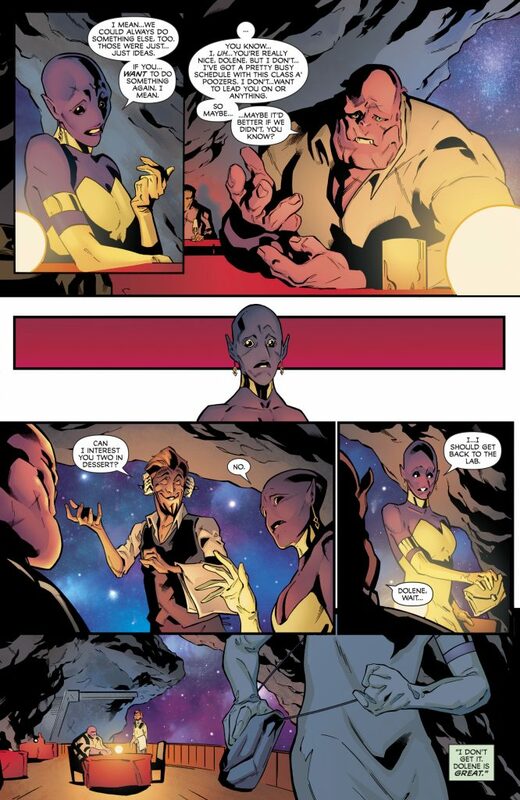 Tynion’s script is in line with some of his best creator-owned work, thought-provoking and upsetting while examining the ways that love can mislead and corrupt us. Marino’s art captures the best Kirby aesthetics and uses these throwback flourishes very well, with a great assist from Fajardo’s colors. 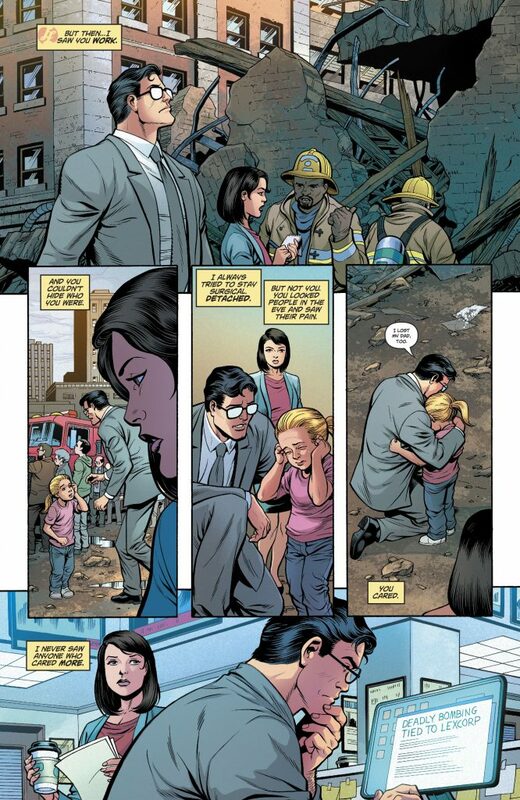 Meanwhile, Loveness and Grummett’s heartwarming Superman/Lois Lane short showcases exactly the sort of sincerity that you’d want to see in such an anthology; it takes great consideration in showing how love helps us overcome loneliness and uncertainty. 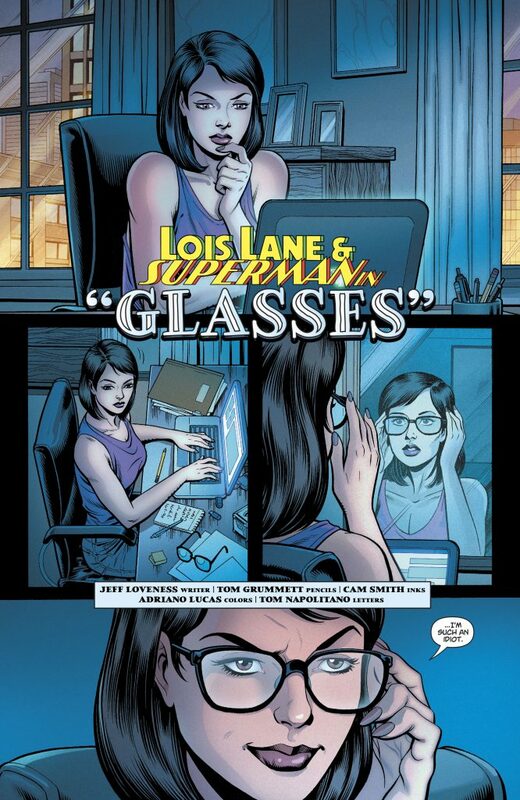 It’s perhaps one of the best distillations of Lois and Clark’s relationship I’ve ever read. DC has been on a respectable roll with their holiday-themed anthologies in this post-Rebirth Era, and Mysteries of Love in Space is a lovely continuation of that trend. One hopes DC will continue to publish these collections; they aren’t just a fun way to broaden the DC Universe, they also serve as a wonderful playground for the many terrific creators that we all know and love. Written by James Tynion IV, Kyle Higgins, Saladin Ahmed, Cecil Castellucci, Aaron Gillespie, Andrea Shea, Jeff Loveness, Gardener Fox. 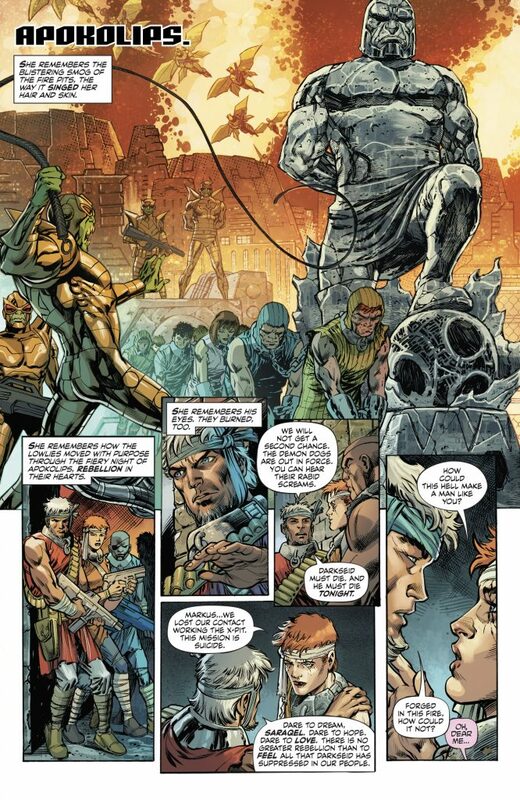 Art by Jesus Marino, Cian Tormey, Max Dunbar, Elena Casagrande, Max Raynor, Amancay Nahuelpan, Tom Grummett, Mike Sekowsky. Inks by Cam Smith, Bernard Sachs. 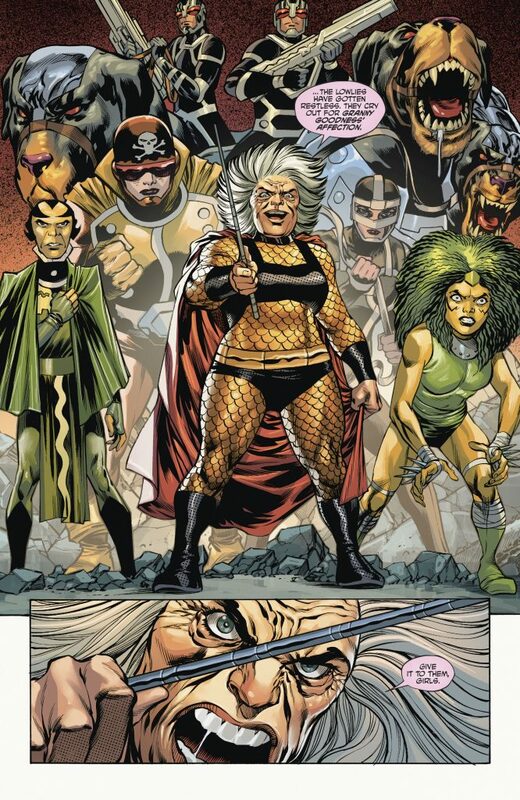 Colors by Romulo Fajardo Jr, John Kalisz, Paul Mounts, Jordie Bellaire, Hi-Fi, Trish Mulvihill, Adriano Lucas. Letters by Clayton Cowles, Dave Sharpe, Steve Wands, Tom Napolitano. Check out this 22-page preview (!!!) 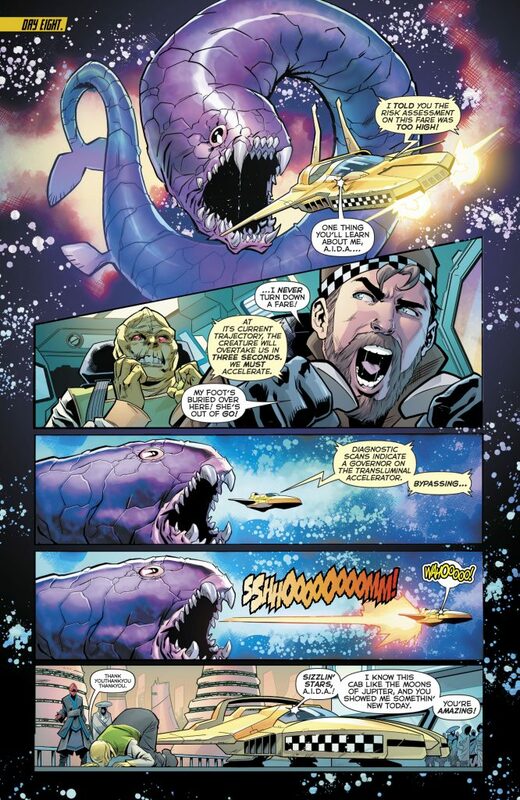 of ‘Mysteries of Love in Space’ #1, courtesy of DC!